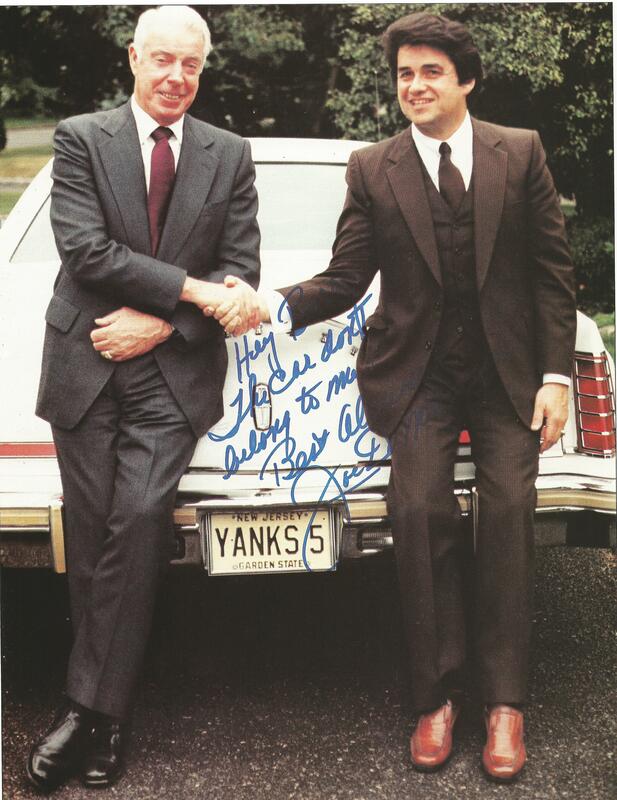 Joe DiMaggio and collector Barry Halper were close friends until a falling out in the early 1990s. Halper claimed to own DiMaggio's 1951 WS ring and the Yankee Clipper authenticated it for him with a signed index card. Last week the New York Post reported that Hunt Auctions is offering Joe DiMaggio’s 1951 World Series ring in its annual auction at the Hillerich & Bradsby Company in Louisville, Kentucky. According to the Post, the ring being offered by Hunt has stirred up a long-standing controversy over the alleged theft of most all of DiMaggio’s World Series rings from a New York hotel room in the 1960s. DiMaggio was wearing his 1936 World Series ring at the time of the incident, however, the “Yankee Clipper” claimed that all of the other rings had vanished from the Lexington Hotel. The Yankee World Series ring being offered by Hunt this weekend, with an estimated value of $100,000,was consigned by the family of an executive who worked for the ring manufacturer Dieges & Clust. The family claims that the ring was originally DiMaggio’s and was given to their relative soon after it was made for DiMaggio in 1951. According to Hunt, “The senior salesman of Dieges & Clust had been working with Joe DiMaggio and another Yankees player during such a visit, when according to family history, DiMaggio had indicated he would prefer to have another award from the firm such as either a hunting rifle or custom made fishing rod with solid gold engraved handle…” Hunt says the ring was given to the executive “who retained it and wore it proudly for the remainder of his career until his passing and subsequent bequeath to his family.” The ring is engraved on the inside band “Joe DiMaggio” and bears the Dieges & Clust hallmark along with a mark designating the ring as “14K.” The ring currently has a bid of $29,586 and will be auctioned off this weekend at a live event at the Louisville Slugger Museum. 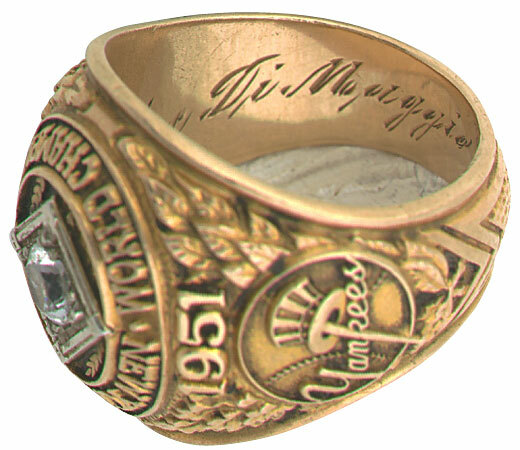 Hunt Auctions is currently offering this 1951 Yankee World Series ring attributed to Joe DiMaggio at an auction in Louisville, KY. The New York Post report, however, did not indicate that there is at least one collector in the country who believes he has already purchased DiMaggio’s 1951 World Series ring. He paid $37,043 for the ring when it sold at Mastro Auctions in February of 2001 accompanied by what Mastro described as a “note, handwritten and signed by DiMaggio, on an index card which reads simply: “My 1951 World Series ring (signed) Joe DiMaggio.” The ring was described by Mastro as “One of the prizes of The Halper Collection.” The ring originally sold at Sotheby’s in 1999 for $37,375 and also appeared on the PSA “Top 200 Sports Collectibles Sold in the 2oth Century” list. However, just because an item was signed and identified by DiMaggio for Halper, does not necessarily mean the item is authentic. A case in point was when Halper had DiMaggio sign what he claimed was the Yankee Clipper’s genuine 1936 rookie road jersey with the number “9.” Halper later sold that jersey to the Baseball Hall of Fame and MLB as part of a $7.5 million transaction. In 1998, Halper told the press the DiMaggio rookie jersey was purchased by MLB along with his Mickey Mantle rookie jersey bearing the number “6,” however, both of those jerseys would later be returned to Halper by Hall officials who questioned their authenticity. Both jerseys ended up for sale at Robert Edward Auctions in 2007 having been consigned by Halper’s widow after his death. REA sold both jerseys as “vintage style replicas” that were “created with vintage materials” and failed to disclose that the jerseys were outright forgeries previously returned to Halper by the Hall of Fame. (Haulsofshame.com and uniform expert Dave Grob exposed the Mantle jersey as a forgery in the 2010 article “From Relic to Replica?”) REA also falsely claimed that the bogus DiMaggio rookie jersey was a replica “made to commemorate DiMaggio’s rookie season.” REA also stated that the jersey would never “fool an expert” despite the fact that it did, in fact, fool MLB and the Hall of Fame at the time it was purchased from Halper. Hunt Auctions does not mention in its current lot description the existence of the controversial Halper-DiMaggio 1951 ring and note that has been the subject of several articles published in the New York Daily News and described in detail in the biography written by Richard Ben Cramer Joe DiMaggio: The Hero’s Life. ” When I visited him in Florida a few weeks later for a five-hour interview, I noticed the gold diamond-encrusted ring glistening on the third finger of his left hand — his 1936 World Series ring, his rookie year. ”My other World Series rings were stolen,” he said. This 10K ring attributed to Joe DiMaggio was sold by Barry Halper at Sotheby's in 1999. Engelberg also accuses legendary memorabilia collector Barry Halper, a longtime DiMaggio friend and business associate, of shady dealings: Engelberg says he tried, unsuccessfully, to stop Halper from selling DiMaggio’s 1951 World Series ring after the Yankee Clipper’s death. Engelberg says the ring – and seven others later obtained by Halper – were stolen from a hotel. In the most recent New York Post article related to the controversy, Engelberg claims that the Halper ring was one of the items stolen from Joltin’ Joe’s hotel room. Joe DiMaggio inscribed this index card for Barry Halper to serve as a letter of authenticity for the alleged 1951 World Series ring attributed to DiMaggio. We also asked Welkowsky whether it could be an authentic salesman’s sample ring from the era? “Most salesman sample rings I’ve seen from that period are 10K, but I have also seen them made in 14K,” said Welkowsky. But Welkowsky also stressed that the only way to determine if a ring was actually presented to or made for a player was to examine the name engraved inside the band. Welkowski said, “Sample rings from that era were not engraved with player names and the engraving on this ring in these photos appears to be vintage. The ring also looks like it was polished outside and inside, too.” Welkowski said one of the best ways to determine if a ring is genuine is to compare it with other known authentic exemplars. In this case he compared the hand-engraving on the DiMaggio ring with the engraving on Casey Stengel’s 1951 ring which was sold by his family at Sotheby’s/ SCP Auctions in 2007. 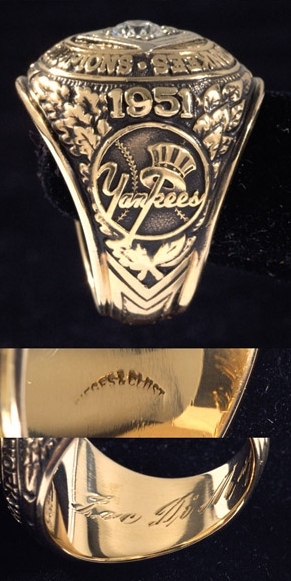 The ring was engraved “Casey D. Stengel” in the same style as the Hunt ring and Welkowski noted that the “D’s” on both examples matched perfectly. Welkowski, however, could not comment on whether he believed the ring was actually worn by DiMaggio or gifted to the Dieges & Clust executive. It is quite possible that the “family history” detailed by the consignor could be true, but there is no way to be sure. Casey Stengel's authentic 1951 World Series ring was sold for $180,000 in 2007 by Sotheby's and SCP with an LOA from the Stengel family. The DiMaggio ring mystery raises far more questions than answers: Why would DiMaggio inscribe a note saying Halper’s ring was his from 1951 if he had gifted the actual ring to the Dieges & Clust executive? Was Halper’s ring a replacement for the stolen example or a replacement for the ring allegedly gifted to the Dieges & Clust executive? Or could it actually be the stolen ring that DiMaggio and Engelberg claimed to have been swiped from the Lexington Hotel? We may never know. Perhaps someone will walk into an auction house in the future with all of DiMaggio’s missing rings minus the 1951 example. Then, and only then, might the mystery actually be solved. For now, bidders in the Hunt Auction in Louisville will have to take a leap of faith and believe in the story of the family of the anonymous Dieges & Clust executive who received a substantial gift from the notoriously frugal “Yankee Clipper.” Hunt Auctions has also announced that the consigning family will be donating a portion of the proceeds of the sale to the Joe DiMaggio Hospital in Florida. Haulsofshame.com contacted both David Hunt, President of Hunt Auctions, and DiMaggio’s former attorney, Morris Engelberg, for comment. Hunt responded but declined comment while Engelberg did not respond to our inquiry. Hunt would not disclose the identity of his consignor for the Post story which reported: ”According to one story, DiMaggio — who had several other Yankee World Series rings — passed on the first design of this particular ring. “Joe told the salesman, ‘I want something else,’ ” said Hunt. UPDATE (Saturday): The 1951 DiMaggio World Series ring did not sell earlier today at the Hunt Auction held at the Louisville Slugger Museum. It appears the bid did not meet the reserve set by the auction house. Maybe Joe misplaced the rings in one of his trash bags filled with cash. Peter, do we know if the signed index card above is or isn’t a forgery? Is it possible the autograph is genuine, but the two lines above it were forged later? What does everyone think? Hi Peter, any time frame when the book is going to be out? 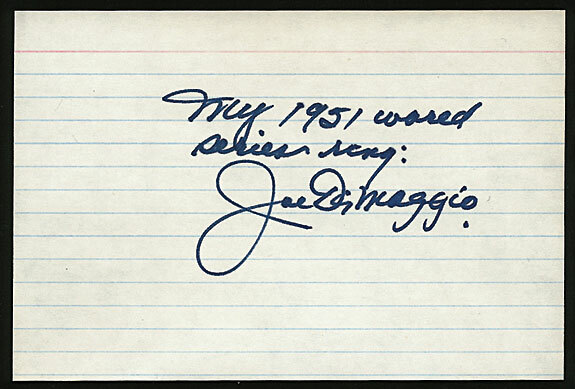 It looks genuine to me, but I’ll show it to a few people more familiar with DiMaggio’s handwriting. Seth- The book should be out sometime in 2013, but no definitive date yet- still being edited. Hard to believe anything that was said by Halper and Engleberg too. Engelberg really paints Halper as a leech and a lowlife in his DiMaggio book while Richard Ben Cramer described Halper in glowing terms. I thought both books showed what a prick DiMaggio was late in life. This is the best story yet. Joe DiMaggio is historically interesting. The roots of this mysterious 1951 World Series ring is too shadowy and dark right now, but the truth surrounding it should remain important. Barry Halper’s involvement with it is also significant in some ways. Chris, After consulting with several people who know DiMaggio’s signature and handwriting well, it seems that you may be onto something here. We’ll be publishing a follow up article on this issue next week. The first thing I noticed was the picture of the signed index card. I am definitely not any type of handwriting expert. But the Joe DiMaggio signature and handwritten note appear to be written by 2 different people. The “G” in ring and “Gs” in DiMaggio look totally different. The ink on the note appears to be thicker than the ink on the signature. Once again I am not an expert but these things immediately jumped out at me even before reading the other comments. After taking a second look. I think the “J” in Joe gives the illusion that the ink is thicker in the note when compared to the signature. I am interested in hearing an expert opinion. What a complex story–and as usual the contradictions are well laid out. I wonder if they will ever be solved. Look at the “g” in the word ring on the card and look at the “g” in the word belong on the signed photo of Joe and Barry…there the same. Interested in hearing the expert’s opinion! The index card just looks really weird. I know there can be fluctuations in handwriting and there are similarities, but fakes are supposed to look like the originals. Id like to hear what the experts say. Sports-memorabilia auctioneer David Hunt says the ring has been held for decades by the family of an executive of the Dieges & Clust jewelry company. Thank you Scott Welkowsky for bogus Angels World Series items you sold me in 2002. I was told every signature on the bat, ball and team picture were fakes. Would you like to purchase them back?